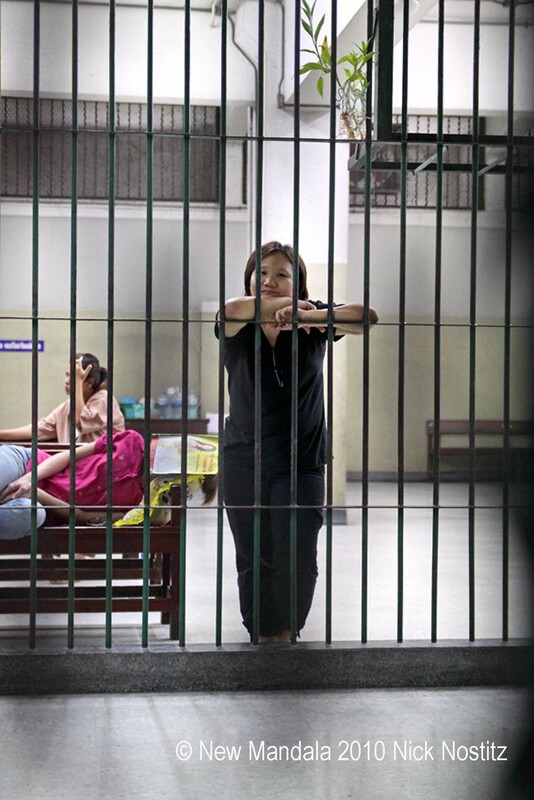 Not long after Black Saturday, I met a Thai woman so dangerous that the Thai state is trying to put her behind bars for the rest of her natural life. We met on Silom Road, near the Rajaprasong protest site. A few nights before, I had watched a mob hurl rocks, bottles and abuse at Red Shirt barricades. Then five M-79 grenades had exploded amid the crowd. One person was killed and dozens injured. The government and the Red Shirts blamed each other, and the perpetrators were never found. Chiranuch Premchaiporn doesn’t look very dangerous. She is a short, slightly plump woman of 43 who runs an independent news website called Prachatai. She is also one of first Thais to be prosecuted under the Cyber Crimes Act. Her offence? Someone made an oblique but unflattering comment about a member of the Thai royal family on Prachatai’s webboard, and Chiranuch didn’t remove it quickly enough. If convicted of all ten counts against her, she faces 50 years in jail. Prachatai — the name means “free people” — has been shut down. Meanwhile, chaos spreads. As I write, there are more clashes, more deaths, more injuries. Elsewhere in Thailand, Red Shirts shut down city halls and obstruct military personnel and equipment bound for the capital. The Yellow Shirts have reappeared to demand the army declare martial law. In Bangkok, grenade attacks and drive-by shootings — usually at night, on government or military buildings — are now so frequent I barely register them. There is talk of civil war, rumors of another military coup. Is Thailand growing up or falling apart? It is too early to tell. But the old stereotype of Thais — simple, fun-loving, apolitical, as loyal as Labradors — is shattered forever. Chiranuch is relieved. “We’ve woken up from a fairytale,” she says. Then we walk together down Silom Road, past coils of razor wire and shuttered shops and soldiers with assault rifles, towards whatever kind of Thailand comes next. Many thanks to Nick Nostitz for the photo of Chiranuch. Nick’s latest book ,”Red vs. Yellow, Volume 1: Thailand’s crisis of identity,” is available from all good bookstores. She get bailed out with 200000 THB cash. She shouldn’t be arrested at the first place… I agree with you. A good update of Chiranuch’s situation can be found at thaipoliticalprisoners.wordpress.com. If you try to access this in Thailand, you are directed instead to a page with the following message: “An access to such information has been temporarily ceased due to the order of the Centre for the Resolution of the Emergency Situation (CRES) under the authority of emergency decree B.E 2548 (A.D. 2005).” But many free proxy servers will allow you to access the site. It seems that the more this computer crimes act and lese majeste are used, the closer we get to an entire collapse. “Is Thailand coming apart,”asked Andrew. It might well be that it has already come apart, and the question is what happens next. With more than 160 lese majeste cases under its belt in 2009, the Abhisit govenrment helps Chiranuch answer the question: Thai is becoming nothing like a democracy. stereotypes are unwise and should be discarded but then again SE Asia doesn’t exactly have a solid track record in “democracy” does it?